Sen. John McCain incorrectly claimed that earmarks nearly doubled from $7.8 billion to $14.5 billion in Newt Gingrich’s first two years as House speaker. Actually, the increase was about half that. Furthermore, earmarks first peaked, then declined under Gingrich. By the final year of his speakership, earmarked spending was 20 percent higher than before, not double. McCain is a longtime opponent of earmarks, which are pet projects added to annual appropriations bills at the request of members of Congress. McCain, who has endorsed former Massachusetts Gov. Mitt Romney for president, has been making an issue of earmarks to help undermine Gingrich’s claim that he is a fiscal conservative. The Romney campaign has posted McCain’s critical remarks about earmarks on its website. It’s true that spending on earmarks went up while Gingrich was speaker. But McCain is cherry-picking data to make it appear spending increased more than it actually did. 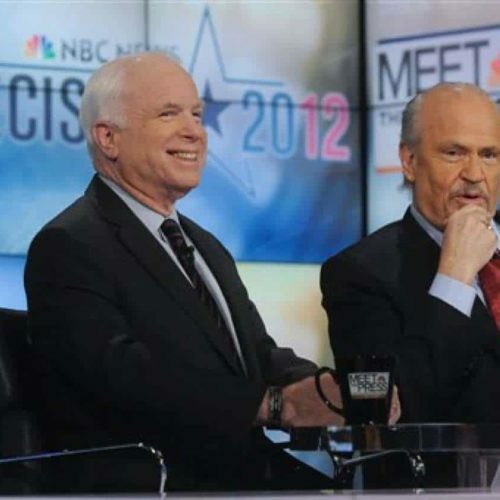 McCain misled viewers of “Meet the Press” to believe that earmark spending rose 86 percent in Gingrich’s first two years — but the rise was actually 45 percent. Also, McCain ignores that such spending went down in Gingrich’s final two years, so the last budget passed when Gingrich was speaker represented a modest 20 percent increase over four years. The senator relied on data compiled by Citizens Against Government Waste. That data show that Congress spent $7.8 billion on earmarks in fiscal year 1994, $10 billion in fiscal year 1995, $12.5 billion in fiscal year 1996 and $14.5 billion in fiscal year 1997. But here’s McCain’s problem: Gingrich became speaker in January 1995, and the first set of annual appropriations bills to be passed under his leadership was for the fiscal year 1996 budget — which congressional historians will remember triggered a battle that led to two partial government shutdowns in November and December of 1995. Fiscal years run from Oct. 1 to Sept. 30, so the fiscal year 1996 budget started Oct. 1, 1995, and ended Sept. 30, 1996. In order to show the growth in spending under Gingrich, one would have to compare Gingrich-era spending bills to the fiscal year 1995 spending bills, which were signed by President Clinton prior to the November 1994 election that gave Republicans control of the House and elevated Gingrich to speaker. Earmarks totaled $12.5 billion in fiscal year 1996, the first budget under Gingrich. That’s an increase of 25 percent compared with the prior year’s budget bills ($10 billion in earmarks in fiscal year 1995). Earmarks increased again in fiscal year 1997 — reaching a high of $14.5 billion in the Gingrich era. That’s an increase of 45 percent over two years, not 86 percent. But then spending on earmarks started to decline — a point that McCain ignores. Earmarks dropped to $13.2 billion in fiscal year 1998 and $12 billion in fiscal year 1999, according to the CAGW database. Gingrich left Congress in January 1999. The fiscal year 1999 spending bills were all signed into law in 1998, making the FY1999 budget Gingrich’s last as speaker. So, McCain is right in that earmarks did reach $14.5 billion while Gingrich was speaker. But, in fairness to Gingrich, McCain was wrong to use $7.8 billion as his baseline to show the growth in spending. Plus, earmarks did drop to $12 billion before Gingrich left office. McCain wasn’t alone in misusing CAGW’s data. ABC News in December and the National Review in January both mistakenly said that earmarks under Gingrich “nearly doubled” (National Review) or “roughly doubled” (ABC News). Both cited the CAGW database. ABC News, Dec. 15, 2011: ABC News has taken a look back at Gingrich’s record on the issue of so-called earmarks — a common congressional practice of inserting taxpayer money for special projects into big appropriations bills — and found a startling spike under Gingrich’s leadership as speaker. Not only did earmark spending in Congress increase between 1994 and 1998, when he departed, the overall dollar amount roughly doubled. National Review, Jan. 27: Earmarks nearly doubled under Gingrich’s tenure as speaker, according to an analysis done by CAGW. In fiscal year 1994, $7.8 billion in earmarks was included in the budget. By fiscal year 1997, that number had skyrocketed to $14.5 billion. The funds allotted to earmarks tapered off a little by 1999, when earmarks totaled $12 billion, but they would never again drop to 1994 levels. The 2010 budget included $16.5 billion in earmarks, according to CAGW. Both news organizations made the same mistake McCain did in using fiscal year 1994 as the baseline, instead of fiscal year 1995. In addition, ABC News used fiscal year 1998 as Gingrich’s last, when in fact he was still speaker when the fiscal year 1999 spending bills passed Congress and were signed into law, as we said earlier in this article. Even so, the true explosion in the growth of earmarks occurred in the early to mid-2000s — after Gingrich left office. After falling to $12 billion in fiscal year 1999, spending on earmarks steadily climbed and reached a peak of $29 billion in fiscal year 2006, according to CAGW’s database. That’s an increase of 142 percent in seven years.